Yesterday was one of those days when you crave for good food someone else cooks for you.. I didn't have anyone to cook for me though. We were hungry at 7pm. What better to have a good early dinner! 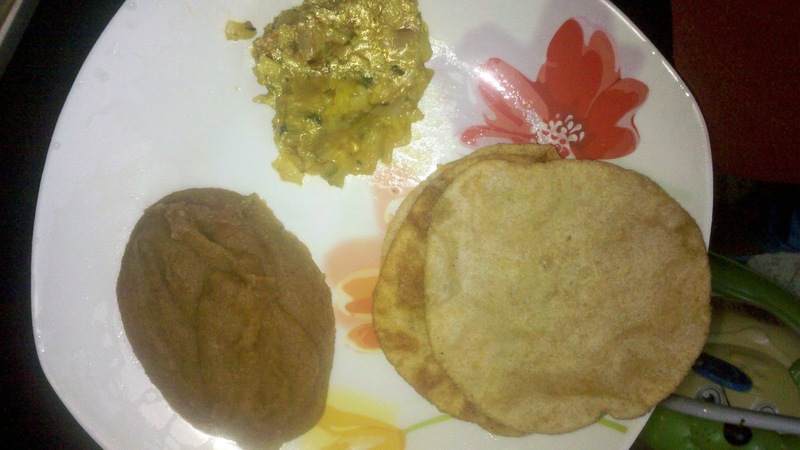 I made pooris, cabbage veggie and halwa. Heat 2 tbsp ghee and roast the gram flour till the color changes. Add the milk / water to the flour and keep stirring to avoid lumps. Add sugar / jaggery and mix till it dissolves. Add the remaining ghee and mix till it becomes a lump. Serve in bowls. Optional- You can add some raisins and roasted nuts and also some cardamom. To my halwa, I added 1 cup semolina / rava / sooji and 1 cup besan.